Practice does help make you better. But if you want to tumble stronger, jump higher, and kick better, then you’ve got to focus on your recovery just as much as practice. Just like any other sport, cheerleaders and gymnast need to take the time to practice, strength-train and stretch—this is especially important to increase flexibility. With so much pressure, bodyweight and demand place on the body during cheer and gymnastics, athletes need to also take part in a proper recovery program daily. Post-workout recovery is more than just a cool down stretch. Post-workout recovery involves stretching, rolling, icing and more. It allows your body to repair the muscles that were worked during activity so they are healthy to go the next day. Stretching helps increase your range of motion, which decreases the resistance on your muscles during activity, improving your flexibility. Consider a Compex device to recover faster and pain-free. This small EMS device is like a self-massager. Small electronic pulses are delivered to your nerve fibers in order to create involuntary muscle contractions—bringing fresh oxygen and nutrients to your muscles to flush toxins out within 4 to 6 minutes. Simply put the small self-adhesive pads (electrodes) on the muscle area you’d like to work. Select recovery and let Compex help you get repair your muscles. Ice therapy can help reduce inflammation or joint pain that occurs post workout. You should apply ice after a workout or practice to keep swelling at a minimum. Hyperice keeps the ice in place while applying compression to the sore/worked area—reducing your risk for injury. Studies suggest that post-workout massage reduces swelling, preventing sports-like injuries. And who doesn’t love a massage? Simply use a foam roller or small firm ball to roll out sore muscles from your practice. This simple practice flushes lactic acid out, reducing the next-day soreness. Topical creams and gels can offer a little heat when muscles are tense, allowing your body to reduce stiffness. A tight muscle limits your range of motion, which is an open door to injury. Apply a small amount to your injured area to get the blood flow moving and ease tension. With a little compression and muscle support, braces can help take away chronic muscle pain. If you have nagging pains from repetitive wear and tear, look for a wrap that can allow you to stay moving without any limitations. A basic brace can support and reduce pain, giving you the confidence you need to jump, kick, flip and tumble. Treating Sports Injuries: Ice or Heat? 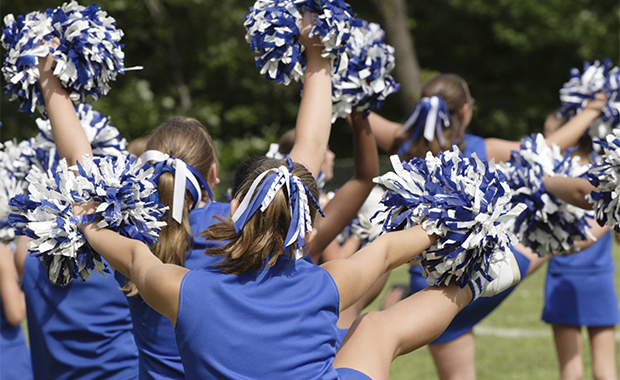 Find cheerleading camps for your ACTIVEkids.